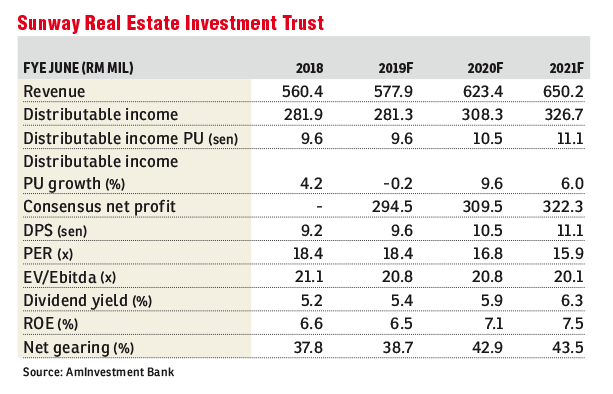 Maintain hold with a fair value (FV) of RM1.75: We maintained our “hold” call on Sunway Real Estate Investment Trust (Sunway REIT) with a higher FV of RM1.75 from RM1.68 based on a financial year 2020 (FY20) target yield of 6%, following an earnings revision on FY20 earnings. We maintained our FY19 forecasts unchanged at RM281.3 million, and raised FY20F and FY21F earnings by 3.5% and 4.2% to RM308.3 million and RM326.7 million respectively. Retail properties remain the key driver for Sunway REIT, especially the Sunway Pyramid Mall contributing 56% of total net property income. The company plans to increase contributions from other segments and locations to diversify its earnings base. The acquisition of education properties — land and buildings known as Sunway University in December 2018 — will be completed by the first half of 2019, with the full-year contribution expected in FY20. Occupancy rates at Sunway Pyramid, Carnival and Putra Mall are strong at 99%, 98.2% and 91% respectively. Sunway Pyramid and Carnival have captive markets surrounded by mature townships, making them the leading malls at their locations, offering a wide array of retailers. At Sunway Resort Hotel and Spa (SRHS), the grand ballroom and meeting rooms’ refurbishment was completed in the second quarter (2Q) of FY19. SRHS resumed business upon the refurbishment’s completion. Meanwhile, the recently acquired Sunway Clio Property has started contributing in 3QFY18, with a full-year contribution seen in FY20. In Seberang Jaya, Penang, the Sunway Carnival Mall expansion is scheduled to be completed by FY21. This expansion will see Sunway Carnival doubling its gross floor area to 1.45 million sq ft from the current 780,000 sq ft, while its net lettable area will expand to 830,000 sq ft from about 500,000 sq ft. These will contribute an additional 5% to Sunway REIT’s total revenue per year. Management has guided a flattish growth for FY19, hence we are maintaining our FY19 numbers. Nonetheless, we have revised our FY20F and FY21F earnings upwards by 3.5% and 4.2% to reflect the full-year contribution of the Sunway University land acquisition and the SRHS refurbishment’s completion. This article first appeared in The Edge Financial Daily, on March 19, 2019.